In the modern world, almost all the premises are equipped with the additional sources of heating. This is due to the peculiarities of the climate in our country, not very qualitative constructions of houses, etc. Recently, installations, operating on the principle of infrared heating, are becoming more and more popular. In this review, we are going to describe the ceiling infrared heaters according to their efficiency, construction and highlight the main advantages of these devices. - the amount of the heat loss is huge. Ceiling infrared heaters work on the absolutely opposite principle. A special feature of their work is heating directly the objects in the room. So, for this systems, people are the objects as well. The device heats all the objects before heating the air. And it does not take much time since the heated objects have good thermal efficiency as well. - film panels: may be used for creating comfort heating zones in the house (e.g., in the children room). Basically, it is possible to determine the main purposes for the installation of the devices from the kinds of the devices mentioned above. Ceiling infrared heaters are classified into two types: the type for the industrial and domestic purposes. The first – devices of a high power for heating large workshops, enterprises, etc. The second — compact installations designed for heating an apartment or a separate zone (in the case of local heating). We have already mentioned the disadvantages of the devices working on the principle of convection. Now we have to understand what are the benefits that are provided by the infrared systems. - energy savings: firstly, the efficiency of these systems pretty often goes up to ninety percent, and secondly, expenses on the electrical energy reduce due to the fast operation of the device. Moreover, there are preset regulators in many models that switch off the system when the temperature in the premise reaches the specified limit. - security: these devices are safe, there are no fire risks and threats possible and also these devices do not "kill" the microclimate of the premise - do not drain the air and do not "burn" oxygen. This explains why they are very popular as the heating devices for the kids' rooms. - easy in installation: the installation of the devices is very simple, it does not require any special skills— the only thing that is necessary to install the heater is to mount two hooks into the wall or ceiling where you will hang the device. 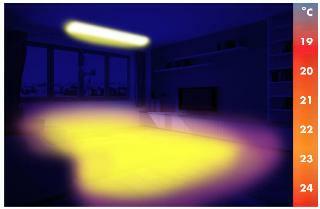 Thus, ceiling infrared heaters are the best solution for home heating. A number of advantages makes them more suitable as an additional system for the room or industrial heating. Of course, the price is significantly higher compared with the price of the convection heater, however, a high degree of efficiency and energy efficiency pay the purchased heater off. Industrial expenses on the energy resources also significantly reduce in a small period of time.